When the new year has just begun, everybody hope it will bring peace, health and prosperity. This was the same wish that Giovanni di Mone Cassai, a notary by profession, and monna Jacopa di Martinozzo had in January 1401, about 600 years ago, in a small village just outside of Florence with the birth of their new son: Tommaso. This legend could resemble an ordinary Christmas tale. No one would have imagined that little Tommaso, nicknamed Masaccio, would soon become the first painter of the Florentine Renaissance. From the very birth of this extraordinary artist, it was clear that he was living in an usual epoch, sometimes difficult to decipher. 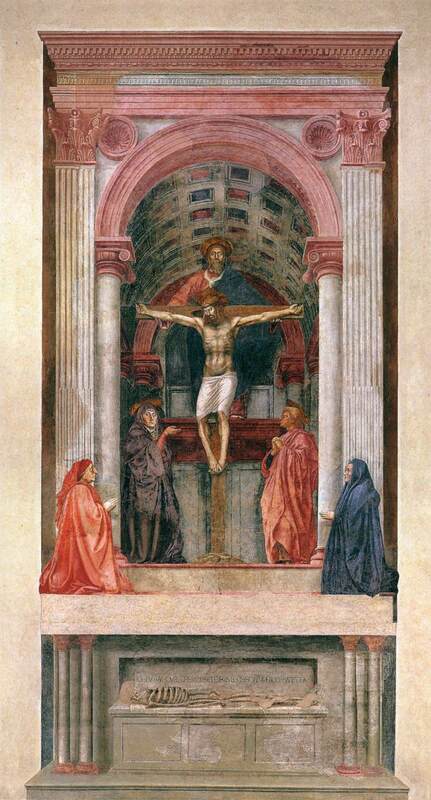 Getting back to Masaccio we find him in Florence in 1417. He officially became a painter in 1422 when he enrolled himself in the school of medicine and spices. Now what does medicine and spices have to do with it? Here is the first interesting point: in those times painting (as well as sculpture) was considered a minor art, equal to common crafts. The academies did not yet exist and so in order for a painter to acquire professionalism, he was forced to enrol in the Association of Medicine and Spices. The colors, extracted mainly from cooking spices and from minerals and also used in the medical field, were furnished to the painters by the very traders of those products. Together with Masaccio, architect Filippo Brunelleschi and sculptor Donatello, were the other two founding fathers of the artistic Renaissance. The three artists were all friends. I would like to tell you about a fresco on the left wall of Santa Maria Novella Church in Florence which was done by Masaccio in 1427, when he was 26 years old. It is called "La Trinità" or "The Trinity" and it truly manifests Renaissance painting. Let's look at it together: It is more than 6 meters high and 3 meters wide. The fresco represents God the Father holding Christ on the Crucifix and showing it to the people. Between the two, a dove flies silently representing the Holy Spirit. The Madonna and St. John are at the feet of Christ. This sacred group is inserted in an architectural structure, a chapel, that ideally separates them from us as well as from the two people kneeling at the bottom of the scene. The married couple Cardoni, the actual purchasers of the fresco, are also present in the painting. He is dressed in red and she in blue. They are depicted not only in prayer, but they also serve as a reminder to posterity of the glory of their "generous" family. Underneath them, there is an altar on which a skeleton lays and on which there is a horizontal inscription which quite clearly states: "I already was what you are. What I am, you have yet to be". The fresco has in itself all the characteristics of new art: a perfect perspective element; an architectural frame in which every single element- capital, column, arch, vault- derives from models of ancient Roman architecture. Finally, an unedited realism in the representation of the bodies and the expressions of the characters, no longer icon-like as in traditional medieval style. In fact, notice that the male Cardoni on the left of the fresco is painted with his ear bent due to his red hood. There is no element present of the traditional gothic style in any form. The figures are inserted in a space that appears believable, and life-like to us because each element is so organized and well thought out. It seems that the air in the church, with its scents of candle wax and incense, could almost penetrate and circulate freely. We as spectators that walk in the church sniffing the air, are called to take part in that space (you'll see, in fact, that the Madonna is turned towards us pointing to her son). There are no barriers that separate us from the painting. We are the ideal continuation of the fresco so much that the space in the chapel depicted in the fresco proposes itself as an illusive continuation of the church. With Masaccio's "Trinity", a work of art has become interactive with its public. Of course, today now that we are familiar with computer graphics and virtual reality, the revolutionary impact of this painting can seem modest. But for the people of that time period, it was an earth-shattering novelty. Masaccio unfortunately, didn't live to be very old and all of his incredible works of art were done before 1428, the year in which he died. And yet the uproar that he left behind with his fresco of the "Trinity" was still present even 100 years later. "But that which is beautiful other than the figures, is the vault which is covered with paintings which demonstrate such incredible perspective that the center of the ceiling in which the paintings convene seems to be punctured" (G. Vasari). I imagine that visiting Florence is an absolute must for those visiting Tuscany. At the same time, I believe that Masaccio's "Trinity" in Santa Maria Novella church (right in front of the train station) is a fundamental stop for those who wish to appreciate the art of our Renaissance - fascinating and yet complex.